They say it's hard to get into medical school, especially as a graduate, and so in a way I feel like a bit of a fraud. I worked hard, but I didn't kill myself over it. I wanted it, but it wasn't my whole life's passion. Perhaps it will become so. And perhaps the work began a long time ago. Like the time a good friend and I sat one of our first degree exams dressed as witches. Or the time I met someone for the first time by falling asleep on them in a lecture. Oh yes, the groundwork was laid long ago. Someone asked me the other day whether I've applied for my place at medical school yet. Was she joking? I revised for the UKCAT entrance exam ten months ago while on holiday in Thailand. In retrospect, probably not the best idea. My friend Garry tried the questions with me (they all seemed to be about families of rabbits hopping at different speeds around rectangular fields, or unintelligible collections of shapes) but the lure of the beach and the cocktails in coconuts was always stronger. I sat the test in September in a soulless building in the middle of Oxford, chewing nervously on fisherman's friends. I didn't do well. Right now I work in a large international development charity (you've heard of it) and last October, med school deadline days, found me on a trip to Colombia, meeting small farmers, visiting indigenous communities, and travelling for three days by boat through the rainforest to remote villages you can only get to by river. It was amazing, but thank goodness for wireless internet. I pulled an all-nighter to write that personal statement, made my uni choices off the cuff based on where I thought I could get in (Kings, no chance. Oxford, ditto. Birmingham, too much concrete but they don't use the UKCAT). I had just hours to submit a reference and my referee was on the road between Spain and Portugal, the other side of the world and several time zones away. Was the wireless even working? The tropical rain fell outside and reggae throbbed out of huts on stilts in the dark. I fired the thing off and went back to looking for huge spiders on my mosquito net. Did I mention that I'm a last-minute kind of girl? I flew back to England, letters arrived from universities, and I swapped the book on 'how to pass the UKCAT' for one on 'medical school interviews'. I prepared answers to the most obscure of questions: 'What do you know about practice-based commissioning? What would you do if your consultant turned up drunk?' I walked into the room shaking, in a suit jacket with the label still on. 'So, have you visited this city before?' Oh come ON! When the decision dropped into my inbox I was at work and too afraid to look. What if it was no? What if it was yes? I still couldn't quite picture it, it was like being me playing a game. What's the hardest thing you can think of? Getting into medical school. Ok, you like challenges, right? But the reality, me with a stethoscope? Surely that's laughable. As the days pass it's become steadily more real, less terrifying, more exciting. At the same time that ego that just wanted to show people I could do it, 'a doctor, wow, you must be really clever', has diminished and I'm left with the certainty that only people who are crazy go to medical school. Ok, when you're 18 you're probably excused (god knows I couldn't make that decision back then) but if you're older and you've tried other things, had time to look at it from every direction and STILL pressed 'accept' on that form, well, then you really only have yourself to blame. As you probably know, I work for Oxfam, at their head office in Oxford. I’m a communications officer and my job involves writing to donors about Oxfam’s programme work overseas – telling people how we’ve spent their money or asking them to give. Part of the job focuses on emergency response work. I write updates about what Oxfam’s doing in Haiti, the Philippines, Gaza. Today I’ve been writing about Pakistan. I don’t really do the stuff you see on posters on the tube or in your spam email folder – the donors I work for are the rich ones, the big givers, celebrities, millionaires, trusts and corporations. But today I wanted to change that for a minute. As I’ve probably told you a million times before, I hate sitting at a desk and I’m not really that likely to be all consumed by my job. But for some reason when I write about emergencies it’s different, and when I find myself moved to tears at work, that’s when I know it’s important. 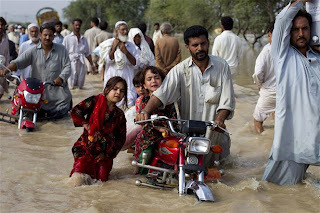 This flooding has been going on in Pakistan for nearly three weeks now. Perhaps it’s not one of those huge shocking emergencies like the earthquake in Haiti, but almost 20 million people have been affected. That’s more than the tsunami and the Haiti earthquake put together. It’s four times the population of Scotland. It’s a fifth of Pakistan underwater. There’s a pretty scary-looking image here of the flooding overlaid on a map of the UK. People are sleeping outside because their homes are gone, and they’re going to start dying of starvation and diarrhoea and cholera because there’s no food and no clean water. A lot of the people affected probably have relatives in the UK. The thing that made me cry was hearing Oxfam’s humanitarian director who has just come back from Pakistan. She said there are whole roads and bridges snapped off that look like they’re in a cartoon, and people are walking for days to get food. She talked to a man who had walked for three days to bring back one bag of flour. When she asked him what he would do in the winter, he just burst into tears. Now you might have stopped reading by now – no-one likes to be guilt-tripped into making a charity donation or paying attention to something on the other side of the world when there are plenty of problems at home. I’m a charity communicator now, for my sins, but I absolutely hate charity communications. I switch off when I see those posters on the tube and I delete the emails straight away. But the longer I work at Oxfam the more I feel that the world is a tiny place, and that it’s nothing but luck that I happen to be here and not there – wherever ‘there’ is on any particular day of writing about emergencies. I think it’s a problem of charity communications that the raw, powerful, human message often becomes deadened into just another shiny marketing slogan. But I just want to say that I’ve seen the original reports from Pakistan before they became branded and marketised. There are real people there, and everything is true. People are people. So if you have anything to spare, please consider making a donation to the Pakistan floods appeal. You can do it at Oxfam's website, where there's also a lot of up-to-date information on the response, or via the Disasters Emergency Committee. I promise that it will be spent well. Note: These are my own personal views, not those of Oxfam. It’s Friday. Breakfast today was amazing... porridge with water and half a banana as usual, but with SUGAR taken from the cafe yesterday. It’s unbelievable what a difference something so small makes. Woke up this morning feeling ill so I spent the day at home. Although this meant I wasn’t tempted to buy anything, it was very hard not being able to eat between meals. I do it all the time usually (which probably isn’t great) but if I do it now then there won’t be any meals left. And anyway, who wants to snack on rice? The 27p chocolate is the only thing keeping me going – whoever decided to put that on the shelves is an absolute genius. It’s not Fairtrade though of course, which just goes to show that some people really aren’t in a position to push for ethically produced products. The small amount of money I have gives me almost no choices and I’m thinking far more about my own situation than that of the cocoa farmer. Dinner: rice with half a tin of baked beans (notice a pattern? ), an apple and some chocolate. I have to admit I cheated though – I had a cup of tea in among my many cups of hot water. I’m really really craving foods that taste of something. Baked beans aren’t normally one of my favourite foods but they tasted amazing after plain rice, and I’m daydreaming of cheese.